Last week we built Lab setup for Lync at Microsoft Egypt premises , Fady Eskander from our technical team in LINK Development was responsible for it and I was helping. 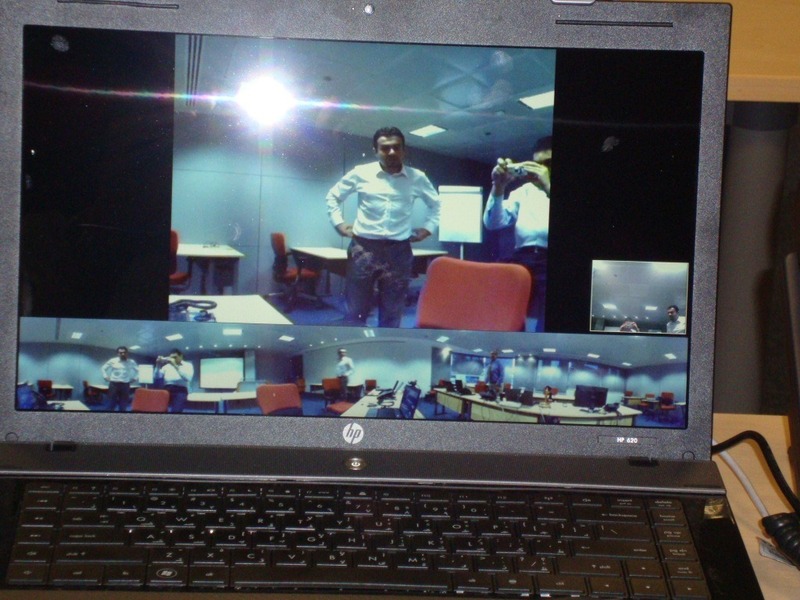 The aim of this setup was to showcase Lync up and running fully featured but more from the end user experience . For this we simulated 6 different types of users , each on his desk with different endpoints even for the same user. 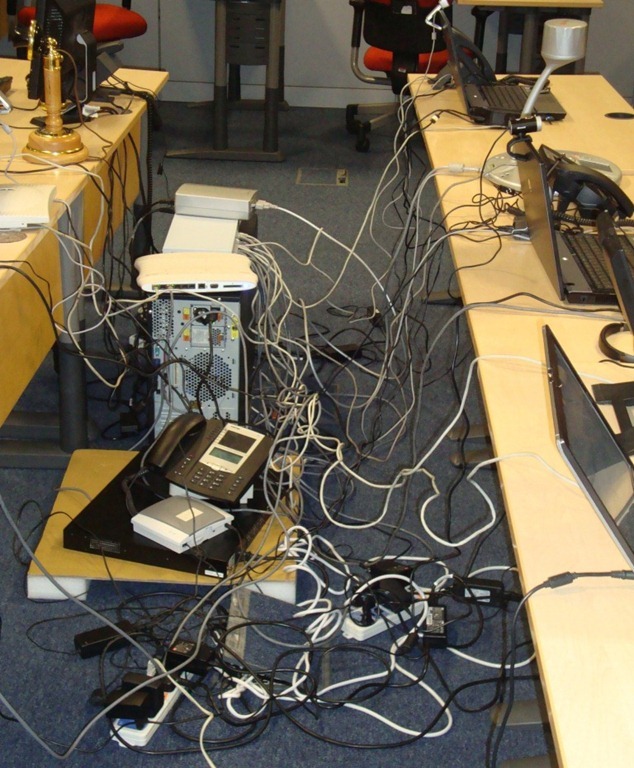 I can tell you that whoever walked in that room to give it a try was really impressed and mostly with the wide range of endpoints and how flexible it is to just unplug and plug devices between different users … Yes Lync rocks and that’s a Fact . 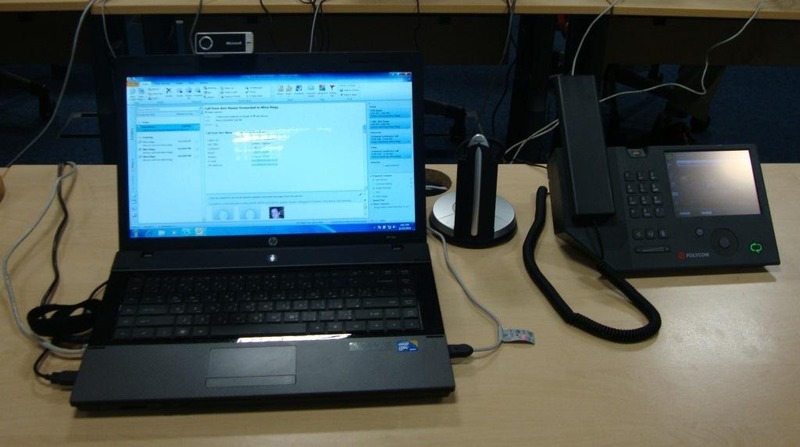 This user got Aastra phone , Polycom ( RoundTable ) ,also connected to it Plantronics Savi W430-M( Bluetooth headset ) , ( Handset lifter ) Oooh that lifter really looked cool when you answer the calls through the Bluetooth headset it just lifts the handset up to pickup the call and once you finish it places it back down.. This is just to show you the round table on full screen , the quality is really great and I wanted so much to give it a try on Plazma screen. And Finally , the backstage setup with the Macaroni cables 🙂 . yes we all know that look and somehow we got used to it. During a very recent engagement with Microsoft Corp. competition team , they shared with me a new customer ready document for Lync voice deployments user experience comparison and I took the permission to share it on my blog. 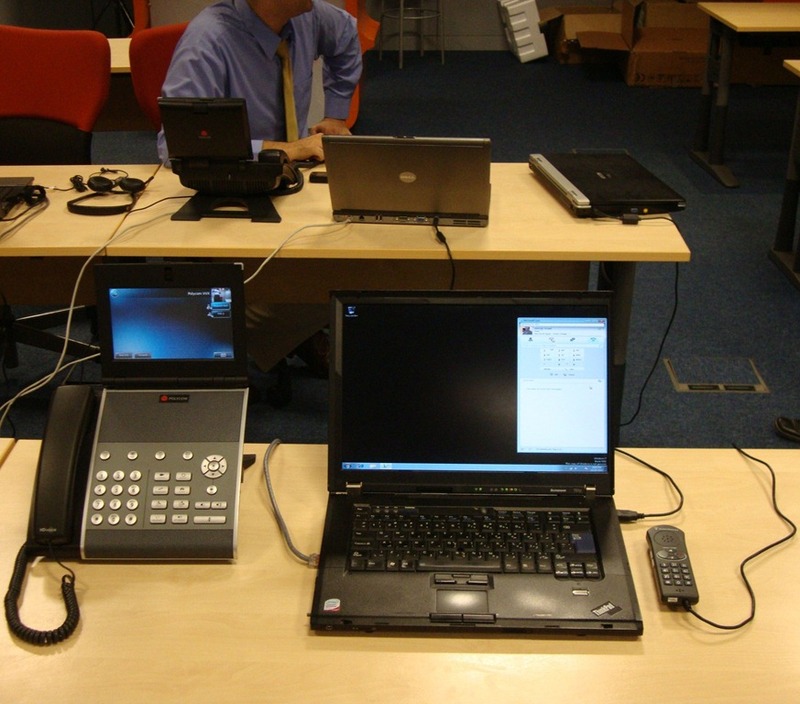 · Replace PBX phones with Lync to improve communications and collaboration, and to reduce infrastructure costs. This is the preferred Lync deployment scenario as it allows customers to simplify their communications infrastructure and rely exclusively on Lync Server 2010 for voice, conferencing, instant messaging and presence. · Enhance PBX phones with the option to use Lync to improve communications and collaboration. 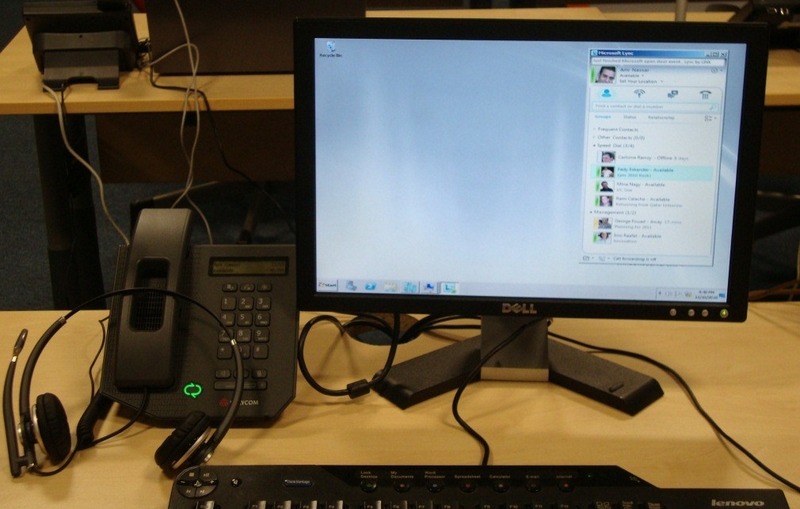 This scenario is useful for organizations that are not yet ready to remove their existing PBX systems, but who want to provide their users either with the option to use Lync for phone calls instead of their PBX phone, or with the option to control their PBX phone with the Lync desktop client. The former approach is useful for providing seamless communications for employees working at home and on the road, and as a transitional approach while PBX systems are amortized and decommissioned. The latter approach is useful for providing desktop “Click-to-call” capability with existing PBX phones. · Add instant messaging, presence, and conferencing to existing phone capabilities.This scenario is useful for customers that want to add Lync capabilities other than enterprise voice. 1. 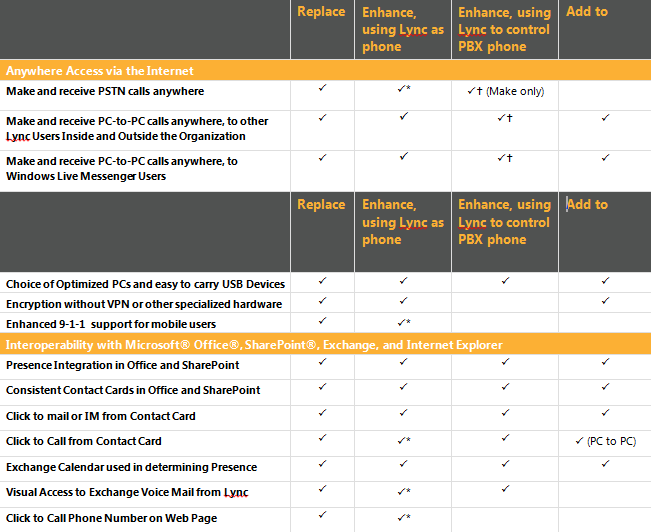 Entries marked “*” in the “Enhance, using Lync as phone” column apply when the user uses the Lync soft-phone only, not the PBX phone. Using the soft-phone in this scenario is the Lync default. 2. Entries marked “+” in the “Enhance, using Lync to control PBX phone” column apply when the user uses the Lync soft-phone only, not the PBX phone. Usng the soft-phone in this scenario requires that the user manually select “Lync call” in a drop-down menu each time a call is initiated. As shown in the table above, with the Replace option, Lync is the only communications system used and provides the full set of unified communications capabilities to users inside and outside the office. 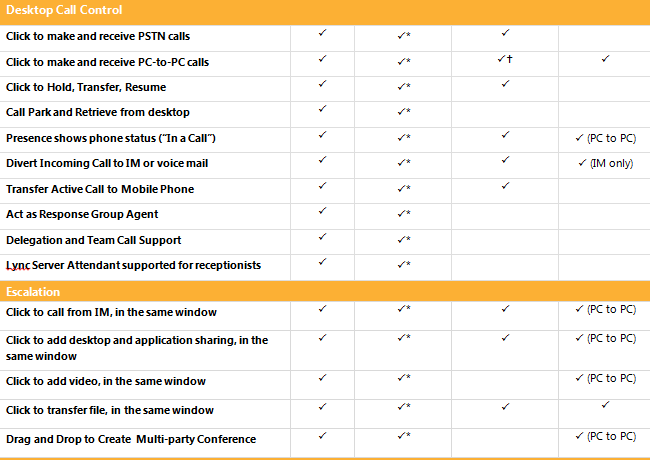 With the Enhance option, users have both Lync and a PBX phone, and choose which phone to use at any given time. 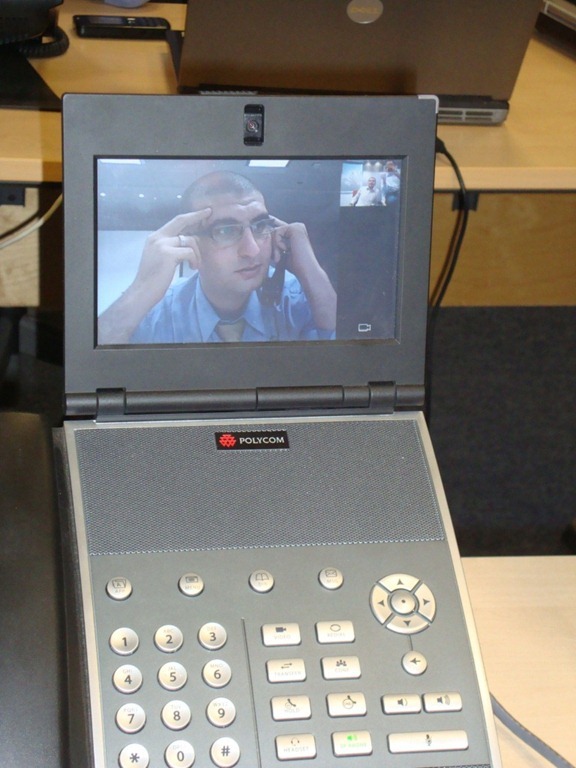 When Lync is chosen as the primary phone, as in the “Enhance, using Lync as phone” variant, users have the full set of unified communications capabilities inside and outside the office; when the PBX phone is chosen as the primary phone, as in the “Enhance using Lync to control the PBX phone” variant, users have a rich but reduced set of unified communications capabilities. · The Replace option allows customers to eliminate separate PBX and conferencing systems and the associated user databases and management tools in favor of Lync Server, Active Directory, PowerShell, and Systems Center Operations Manager. This enables significant capital and operational cost savings, and takes advantage of existing skills in these areas. · The Enhance and Add options require ongoing maintenance of existing PBX systems until those systems are retired. They also require the interconnection of the existing PBX systems with Lync Server, using Direct SIP or a third party gateway qualified via the Unified Communications Open Interoperability Program.This interconnection enables calls to be carried between Lync Server and the PBX systems. 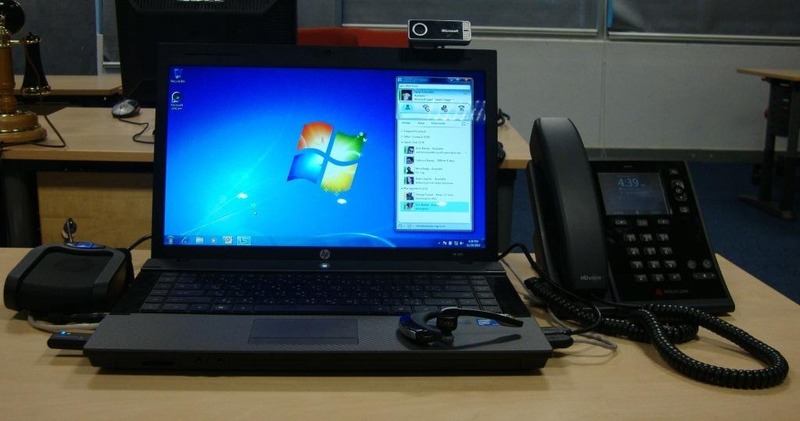 The Enhance, using Lync to control the PBX phone additionally requires the deployment and maintenance of a connection to the PBX. This connection may require a PBX software upgrade and per user PBX software license fees, depending on the PBX manufacturer, and requires associated configuration and management. The table below summarizes the key infrastructure differences for the deployment options. As shown in the table above, the Replace option requires the minimum amount of infrastructure. This enables significant cost savings for organizations: for example, Sprint projects annual savings of over $9 million based on its replacement of nearly 500 PBX systems with Microsoft unified communications technology. The application has failed to start because its side-by-side configuration is incorrect. Please see the application event log or use the command-line sxstrace.exe tool for more detail. Activation context generation failed for "C:\Users\administrator.UC\Desktop\DHCPUtil.exe". Dependent Assembly Microsoft.VC90.CRT,processorArchitecture="amd64",publicKeyToken="1fc8b3b9a1e18e3b",type="win32",version="9.0.30729.4148" could not be found. Please use sxstrace.exe for detailed diagnosis. Solution: Install vcredist_x64.exe from the Lync Server media and run DHCPUtil.exe again.